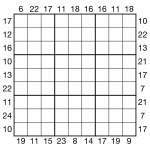 Frame Sudoku 9×9 1 puzzleHere’s a Frame Sudoku puzzle. Each number outside the grid gives the sum of the three nearest digits in that row or column, so for example if there is a 7 outside the grid then there must be a 1, 2 and 4 (1+2+4=7) in the first three cells in that row or column. Regular Sudoku rules also apply – place 1 to 9 once each in all rows, columns and bold-lined boxes. The actual logic in this is not especially tricky, but I certainly found it took me quite a while to test solve it (20 minutes or so, although I was watching TV…) – I’d be interested to know how long it takes you to solve it too!